UFC Heavyweight Champion Brock Lesnar recalls the danger he was in prior to his stunning second round submission win over Shane Carwin in the UFC 116 main event. Lesnar somehow survived 60 punches to the head in the opening stanza, getting dropped and then completely overwhelmed with 5XL fists of fury for about four straight minutes. There were numerous times that Rosenthal could have stepped in, but didn’t, giving Lesnar the benefit of the doubt and giving way to perhaps the most improbable come-from-behind finish in the history of the promotion. Anyone out there thinking that Lesnar, who is a pay-per-view cash cow, got special treatment? Or was it just a (rare) case of superb officiating? 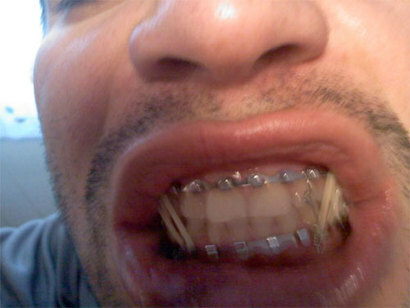 No good deed goes unpunished: Ricardo Romero gets his broken jaw wired shut after big UFC 116 win over Seth Petruzelli. He also sustained a sprained knee and severely-strained pec muscle … all on round one. Ouch. An emotional and obviously excited Chris Leben caps off the greatest two weeks of his career by submitting highly-regarded Yoshihiro Akiyama at UFC 116: “Lesnar vs. Carwin” on July 3 in Las Vegas. After finishing Aaron Simpson at the June 16 TUF 11 Finale, “The Crippler” was flown in as a late replacement for the injured Wanderlei Silva, who was expected to face “Sexyama” in the co-main event. Now Leben holds the “W” over “The Axe Murderer’s” foe and believes that earned him a spot against the dangerous Brazilian. Anyone disagree? — Undisputed UFC Heavyweight Champion Brock Lesnar is quick to thank the “Man in Charge of the Octagon,” Josh Rosenthal, shortly after his stunning second round submission win over Shane Carwin in the UFC 116 main event. Lesnar somehow survived a gorilla attack in the opening stanza, getting dropped and then completely overwhelmed with 5XL fists of fury for about four straight minutes. There were numerous times that Rosenthal could have stepped in, but didn’t, giving Lesnar the benefit of the doubt and giving way to perhaps the most improbable come-from-behind finish in the history of the promotion. It wasn’t the fact that Lesnar was able to rebound — although that in and of itself was impressive — but rather the way in which he did it. With his sheer size and strength, now coupled with a decent jiu-jitsu arsenal to go along with his already stellar ground game, is there anyone who can stop the Lesnar ‘frate’ train? Whoever it is might want to think about bringing a sledgehammer into the cage — Carwin hit him with everything but the kitchen sink and he still hung in there. Would you have stopped it?